Last week I joked with a friend that the story of my life is summed up by saying I come up with great ideas and clients kill them. While certainly an exaggeration – if I never had one come to life I wouldn’t have lasted long in the marketing business – it can certainly feel like client rejection is more a familiar friend than acceptance. Mind you, I’m not a “creative” by advertising agency standards. But in my role as the bridge between creative content and digital/social technology, I’m often asked or have simply assumed to create concepts for digital and social media marketing campaigns. So, while I do not have daily assessment of my creative work, my part includes the additional challenge of explaining how ideas work. Sometimes I have to reassure the client I’m not recommending something that would send their customers a virus or alert homeland security to investigate their digital tactics. The good in my lack of traditional creative training is my approach can really only come from the perspective of the customer. I know no other way. The bad is that I don’t have guardrails. So, my ideas are sometimes not perfectly aligned with the brand, too far beyond the brand’s sense of decorum or far too risky for most marketing managers to be comfortable with. And that means I get a lot of client rejection. A lot of client rejection means I have to find a way to handle it emotionally. If I don’t, I’ll spend all day, every day depressed. Yeah, I let on like I don’t care what people think, but the honest truth is I do – especially the clients and colleagues I work with. We all want to be valued and respected for our work and I’m no exception. So how do I handle the “Uh … no!” reaction from my clients? When a client says they don’t like your idea, that’s exactly what they’re saying. They are not saying they don’t like you. In fact, more often than not, clients love the fact you’re bringing them bad ideas because that mean you’re continuing to think about their business. They know a good one is going to surface. Or a bad one can be polished to be good. When a good one surfaces, they’ll see it, grab it and you’ll run with it, together. To take this point to the extreme, I had a client years ago who swore by one of the popular personality tests. Everyone at the agency took it so he would know what kind of personality he was dealing with in meetings. And he wanted us to know his because it was unique – he would say anything to anyone without consideration for anyone’s feelings. If you knew that going in, you could stomach his rough days easier. We all had a laugh, but he was serious. He happened to be a big analytical guy and could make a scientific argument why the idea was that dumb. And he didn’t care about hurting people’s feelings. But knowing it wasn’t personal made it easier to swallow. All client feedback should be taken that way. You’re a professional. They are dealing with you on a professional level. Technically, no one should care who you are, what your sensitivities are, or what level of praise you need to be happy. You submit your work. They like it or they don’t. If they don’t, you do it over or someone else’s idea gets picked. You move on and work on that. Period. That’s how ideas get vetted and chosen. It has nothing to do with you or your precious feelings. Two of the creatives I work with at Cornett shared stories with me that reminded me a “No” is often an unsupported “Yes.” Whit Hiler, the lunatic behind much of the zaniness at Kentucky for Kentucky (not a Cornett-related client or product), reminded me of his years selling cars, saying rejection is nothing. So if you get client rejection, it may just be that you didn’t illustrate the features and benefits well enough. Remember: You don’t just pitch the idea, you also have to justify it. Chris Barnes, who drives much of the creative behind our work for clients in the Thoroughbred and Tourism verticals, (and resident beer judge) echoed the sentiment. He told me of a story once where he was rejected by a former boss for a rebranding project, but still believed in the rebrand so much he held onto the work, re-formulated a pitch months later and eventually won him over. So remember that rejection once may not mean rejection forever. One client I have now is great about saying, “We wouldn’t do that because …” He doesn’t say things like, “I don’t like that because …” or “That’s a bad idea because …” He says “We wouldn’t do that because …” That means he is always aligning the reason for the “No” to the brand voice, personality, audience, purpose and goal. Don’t be afraid to push for a why, but make sure to ask from the perspective of wanting to learn and find a better idea, not to argue or defend the idea you’ve already presented. Hiler is notorious around the office for doggedly pursuing ideas he thinks will work, even after they’ve been rejected. If his second or third attempt doesn’t work, he’ll even rethink the idea for a different client if he likes it enough. So that can take the sting off — selling it through to someone else. It might sound odd coming from me, but I’m in year five now of a meditation practice that has helped me handle polarizing emotions. By taking 10, 15 or 20 minutes and just breathing … clearing my mind with the intent of not thinking about anything … my blood pressure returns to normal, my heart rate slows to a comfortable pace and I can remind myself that thoughts are just thoughts. I don’t have to feel rejected. I don’t have to feel hurt. I don’t have to feel sad. I can recognize the thought that it’s sad the client didn’t like the idea, but then I can dismiss it. Meditation has taught me that (for the most part) we can choose how we feel*, what we recognize as important and what we dismiss as not. And as Whit so eloquently put it, “Rejection is nothing.” So we can treat it as such. Clearing your mind for a few minutes puts you back in a good place to start over and come up with the next big idea that the client might think is the right one. How do you deal with client rejection? Those are my ideas. What are yours? 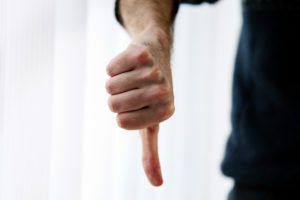 How do you deal with a client who goes thumbs-down on your big idea? Do you take it personally? Why? How do you let it go?